I’ve always listened to country as well as old-time, blues, and bluegrass music. I feel they are all related in an essential way, linked by deep roots and the fact that they come from deep inside people’s experience. Quoted by Chris Stuart in “Alice Gerrard—Not Done Yet,” Bluegrass Unlimited, June 2014. Alice Gerrard looms as a towering female figure in a world that was once the domain of male musicians and business leaders. 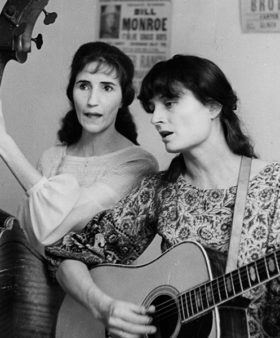 Starting in the early 1960s with singing partner Hazel Dickens, she helped open the doors for a host of up-and-coming women performers and entrepreneurs in the fields of bluegrass and old-time music. Although raised far from the western Kentucky and Appalachian regions that gave rise to bluegrass, Alice was born into a family that cherished music. Her mother and aunts studied classical music in college and were later part of the Symphony Sisters Quartette traveling troupe, while her English-born father was a choir director. In this environment, she experienced a “sense of music as something that you did at home, as part of the fun things you did as a family.” In this respect, her upbringing was not dissimilar from many of bluegrass music’s first generation of innovators. The passing of Alice’s father when she was nine set in motion a series of moves that took the family first to a year-long stay in Guadalajara, Mexico, and then to the southern outskirts of Oakland, California. The last move reunited Alice’s mother with a sister who provided haven for the Gerrards. Her mother’s eventual remarriage to a UC-Berkeley professor resulted in yet another move, this time to Oakland proper. In 1953, Alice enrolled at Antioch College in Yellow Springs, Ohio. Known for its progressive liberal arts curriculum, the locale played a major role in Alice’s immersion into bluegrass and old-time music. It was here that she met Jeremy Foster, a folk musician from the Washington, D. C. area who counted musician Mike Seeger among his high school friends. Jeremy introduced Alice to Harry Smith’s Folkways Anthology of American Folk Music. It wasn’t long until Alice began learning to play the guitar and banjo. It was also in quick order that the duo’s musical relationship morphed into a romantic one; they were married in 1956 and moved to the D.C. area as part of an Antioch work/study program. The move east allowed the couple to partake of the plethora of music that existed in the Washington/Baltimore area. Nearby were country music venues such as Sunset Park, New River Ranch, and Watermelon Park. Jeremy was able to renew his friendship with Mike Seeger, who by now was friends with West Virginia-born singer Hazel Dickens. The growing cadre of friends enjoyed numerous picking parties and Sunday park excursions where they shared “dinners on the ground” with the likes of Bill Monroe, the Stanley Brothers, and others. In 1957, Jeremy took a break from school, was drafted, and served a two-year stretch in the Army. After his discharge, he and Alice returned with a growing brood of children to Antioch to finish their studies. Music continued to be a major part of their lives. Not only did they form a band of their own in Ohio, they persuaded the school’s folksong society to sponsor what are acknowledged as the first college concerts to feature bluegrass music. On March 5, 1960, they hosted a performance by the Osborne Brothers, then residents of nearby Dayton. Two months later, on May 14, a second event featured the Stanley Brothers. Upon Jeremy’s graduation, the family moved back to the Washington area. Alice was now able to work with Hazel to develop their duet singing. At the urging of David Grisman and fledgling music producer Peter Siegel, the women sent an audition tape to Moe Asch of Folkways Records. Production of the duo’s first album was underway in 1964 when tragedy struck: Jeremy Foster was killed in an automobile accident while commuting to work. Jeremy’s passing left Alice in a state of mourning and a single mother of four, but she found the determination to press ahead in her partnership with Hazel. Their debut Verve/Folkways album Who’s That Knocking? was released in 1965. Over the next decade, Hazel and Alice recorded a total of four albums, all of which met with critical acclaim. They appeared on several festivals, including Bean Blossom and Newport, and became active in the Southern Folk Tours that were spearheaded by Anne Romaine. The activist nature of the folk events—which supported civil rights, union rights, and social justice—was in keeping with the “songs with a message” that permeated the duo’s middle ‘70s albums for Rounder. While the Hazel and Alice partnership was developing, Alice kept busy with other pursuits as well. In 1966, she was on the ground floor in the development of Bluegrass Unlimited magazine, which provided employment for the single mother and a forum for a half dozen articles that she authored. She also joined a group known as the Strange Creek Singers, which included Mike Seeger, Tracy Schwarz, Lamar Grier, and Hazel Dickens. The group recorded one album together. Alice and Mike Seeger were married in 1970. In September of 1968, Alice and Hazel interviewed Bill Monroe to obtain song histories for a number of gospel songs that he had recorded in the 1950s. Folklorist Ralph Rinzler produced an album reissue of the material for Decca Records titled A Voice From On High, for which he and Alice co-wrote the liner notes. The Monroe connection continued with Alice co-presenting a Bill, Charlie, Birch, and Bertha Monroe concert/panel discussion at the 1969 Smithsonian Festival of American Folklife. By 1976, Alice and Hazel had grown apart musically and in temperament. The time had come for both to develop separate identities as musicians. While their parting was not acrimonious, it would be twenty years before they would perform together again. Although titled Mike Seeger In Concert, an album of a live 1970 concert in Japan featured both Mike and Alice. The end of the decade saw them collaborating again on album that was simply titled Alice and Mike. The early 1980s found Alice single again and freer to explore her musical options. She moved to Galax, Virginia, where she became an integral part of the local music scene. She often played music with old-time banjoists Andy Cahan and Enoch Rutherford; in a bluegrass band with Otis Burris, James Lindsey, Eldridge Montgomery, and Wendell Cockerham; and served as an advocate for many of the musicians in the area. She drove those who were getting up in years to shop for groceries or to doctor appointments. She used her connections to get others booked on various festivals and concerts within the region. Perhaps her best-known contribution during this era was her championing of old-time fiddler Tommy Jarrell. Alice served as a co-producer of the film documentary about Tommy called Sprout Wings and Fly, and she was instrumental in seeing that he received a National Endowment for the Arts Heritage Fellowship in 1982. In 1987 Alice Founded the Old-Time Herald, modeled after her work at Bluegrass Unlimited. She founded the new magazine to give a voice to the growing old-time music community. In 1989, Alice began the process of donating a lifetime of collected materials to the Southern Folklife Collection at the Wilson Library on the campus of the University of North Carolina at Chapel Hill. Included were live field recordings that Jeremy Foster made with Mike Seeger in the 1950s, as well as a number of her own interviews and recordings of live music made over the years, especially during her time in Galax. She has since continued to add to the collection. The 1990s were busy years for Alice. Her first solo recording, Pieces of My Heart, contained a mixture of old-time songs and fairly recent originals. 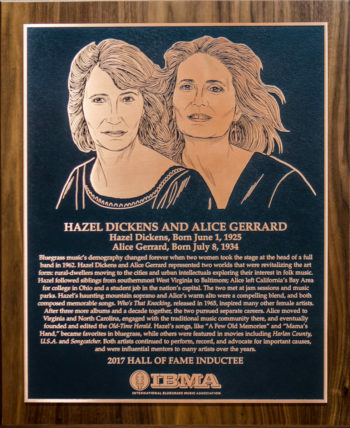 An enthusiastically received Hazel and Alice reunion at the 1996 MerleFest (where Alice also managed the Traditional Stage) opened the door for select engagements by the duo. They went on a West Coast tour in 1997 and played their gig together at the Smithsonian Folklife Festival in 2010. The latter part of the decade saw the first of four eventual releases by the trio of Tom, Brad and Alice. Composed of Tom Sauber, Brad Leftwich, and Alice, the group excelled at presenting a unique brand of old-time music. The International Bluegrass Music Association bestowed its Distinguished Achievement Award upon Alice in 2001. It was a well-deserved honor, but Alice was hardly finished. The new millennium found her continuing to make great music, with several solo recordings and in various combinations with others. Her solo outings include Calling Me Home, Bittersweet, and the Grammy nominated Follow the Music. Her group recordings include Road to Agate with Gail Gillespie and Sharon Sandomirsky; The Cherry Tree with Beverly Smith; Wonderful World Outside with the Piedmont Melody Makers; an all-star outfit with Alice, Chris Brashear, Cliff Hale and Jim Watson; and most recently Tear Down the Fences with Kay Justice. Alice’s Durham, North Carolina home continues to serve as a launch pad for frequent outings to host seminars and workshops and to appear at concerts. We had some good times back in ‘55 . . . . New River Ranch and Sunset Park, the Stanley Brothers, Bill Monroe, Alex and Ola Belle, Jim and Jesse, Don Reno and Red Smiley, Wilma Lee and Stoney . . . Hazel or Alyse [Taubman] would fix huge picnic dinners for everyone, and usually some musician or other would help us eat it. We’d hang around and talk with Ola Belle or Carter or Bill, or go out to the parking lot and play and sing. It would be hot and sticky, we’d get home late, and we loved every minute of it. Alice Gerrard in liner notes to Hazel & Alice, Rounder Records, 1973. We just lived and breathed music. That’s all we wanted to do. And that area [Washington, D.C./Baltimore] was . . . this great cultural meeting place. There were so many people who came from the South to get work, and there was an urban, middle class of college-educated and professional people who were becoming interested in this music. There was a core group . . . they were seeking out the players of this music. Quoted by Jack Bernhardt in “With a Song in Her Heart: The Musical Journey of Alice Gerrard,” The Old-Time Herald, March/Summer 2005. I feel like it’s great that Hazel’s gotten the recognition that she’s gotten. The only time it bothers me is when I feel like people ignore my contribution to the two of us. Because it was a very equal contribution, it wasn’t just Hazel. It was our vision and it was just as much my contribution to material and arranging as it was hers. Quoted by Murphy Henry in Pretty Good for a Girl: Women in Bluegrass, University of Illinois Press, 2013.